On December 16, 1871, Maria Mitchell wrote to the artist and historian Benson Lossing, a Vassar trustee, in great distress. "I must trouble you again! I simply want you to know how things go on. Can it be possible that the Ex. Com. wish to make us uncomfortable?" To make sure he fully understood the situation, she enclosed 7 copies of letters to and from the executive committee and President Raymond. Maria Mitchell had often corresponded with Lossing, usually concerning the upkeep and funding of the observatory. This time her request was different; she demanded justice. Henry Albers, in his book, "Maria Mitchell: A life in Journals and Letters", notes that Maria Mitchell was paid an annual salary less than that received by the male professors when she arrived at Vassar College. He explains, “The trustees felt that this arrangement was justified, because she received free room and board for herself and her father.” Debra Meloy Elmgreen, Vassar's current Maria Mitchell professor of Astronomy, summarizes the situation in the preface of Henry Albers' book. 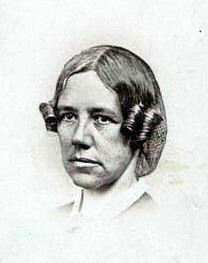 She explains that Maria Mitchell was primarily a scientist, but the salary dispute with the administration started her advocacy for woman’s rights. When Maria Mitchell began to teach at Vassar in 1865, the salaries of professors were fixed at $2000, but the college did not pay for rent, fuel, and lights. Miss Mitchell was paid $800 with rooms and board for herself and her father, but rent, fuel, and lights clearly did not make up the $1200 difference in salary. This differential increased in 1867, when the President was paid $4000, the Lady Principal was paid $1800 and given a home, and Professors Farrar and Tenney were paid $2500, while Maria Mitchell's salary remained the same, $800. At this time the men received $2500 a year without the cost of board, Dr. Alida Avery received $1,000 a year plus board, and Mitchell received only $800 a year and an apartment in the Observatory. Dr.Avery taught Physiology and Hygiene and also served as campus physician. In May 1870, Mitchell and Avery had written President Raymond, asking for equal pay and equal privileges with the other professors. They noted that they had been working for five years for lower pay than some professors with no experience who were offered a higher salary when first hired. In her letter to Lossing, Maria Mitchell enclosed the Executive Committee's reply to their request, and she succinctly explained the situation to Lossing: "The letter which called forth this answer was a simple request for equality in the payment of Professors." Instead of granting that request, the Committee on Faculty and Studies concluded unanimously that there was "no substantial difference in the emoluments now enjoyed by Profs. Mitchell and Avery and those allowed to other Professors in the College." The committee stated, "the professors each receive a salary of $1400 cash, together with furnished apartments, board &c, equal to $450, or more in money value, making the actual compensation at the lowest estimate $1850. The Professors whose compensation is regarded as unequal receive nominally $2500, but of this they are required to pay back to the College $400 or $450 per annum for house rent, their residence upon the premises being in fact compulsory as the Trustees deem the social advantages arising from the presence of the families of these several professors such as to justify them making this requirement." The Executive committee referred to the benefits of furnished apartments and board as "Lady privileges," which was to be a source of controversy later on. Maria Mitchell had written the Executive Committee a year later, in May 1871, making it clear that she wouldn't allow the committee to sidestep the issue of equal pay by charging unequal rents. "We ask that our salaries may not only be the same in amount, as those of the other professors, but may be paid in the same way, leaving questions of domestic arrangements for separate and independent consideration." Anticipating that the Executive Committee would deny their request again she warned, "If the committee feel that to accede to this arrangement is for any reason beyond their power, we ask that our request may be submitted directly to the Board of Trustees." The Committee of Faculty and Studies voted to defer the issue of salaries until after the Board of Trustees meeting on June 20th, 1871. At their meeting the Board passed three resolutions that promised to grant Maria Mitchell's wish for equality. First, it was resolved that the salaries of Professors Mitchell and Avery would be $2,500 each year and paid in the same way as the other professors. Second, the board referred the question of the value of “Lady privileges”, or room and board, to the executive committee, and required them to enter into contracts similar to those of male professors. Third, they resolved that hereafter salary would be decided upon, age, maturity, experience and attainments, and be advanced by the discretion of the Trustees to the maximum salary in the relevant department. These resolutions set the standards of merit and time of service, rather than gender, as the deciding factors in professors' salaries. But a few days later, on June 30th, the Board appointed a committee on the value of privileges of Lady Professors. One of its members, E.l. Beadle, was the same trustee who signed the letter denying a substantial difference in pay a year before. In October, this committee finally decided on a dollar amount for the board of lady professors. They proposed to "fix and determine the value of board, and necessary furnished rooms with light and heat therefore and with ordinary attendance at $16 per week for each of the lady professors, without deduction for any absences, during the collegiate year, and that in addition, the usual charges be made for self, friends, and all laundry work." On November 24, 1871 President Raymond presented the communications from Professors Mitchell and Avery on the value of their privileges to the Executive Committee. These were referred to a special committee, two members of which had been among those who had originally decided on the $16 per week. On December 8 the Committee on Communications resolved to send Professors Avery and Mitchell a copy of the report of the special committee through the President and to remit the mistaken charge of Professor Avery for her 11 days of board while assisting the President. The extract of the special committee’s report, which Maria Mitchell sent to Lossing, did not provide the itemized list of the charges as she requested, and they declined to re-itemize the charges from past calculations "especially when we take into view the liberal increase made at the same time to the salaries of these Professors." Essentially, the lady professors could afford to pay more since they were now being paid more, defeating the purpose of the salary increase. The special committee further justified the charge on the grounds that neither the very low prices fixed for the board of guests, discount rates charged to individuals in the past, nor the nominal value at any time put on a "Teachers Home" in the College, were any more proper guides for the Executive Committee than the rates charged for like accommodations at the best Hotels in Poughkeepsie. The $16 per week charge remained for the time, indirectly lowering the salary of Professors Avery and Mitchell. Maria Mitchell was not a woman to be defeated easily. She felt that she and Dr. Avery were "fighting for all women, for it was more the general than the special injustice that reached us." Accordingly, as the year drew to an end, both professors told President Raymond that they would quit in June. Shocked, Raymond told Maria Mitchell "Now you are not to tell of this hint which I give you – 'write to Lossing'." Initially frustrated with Raymond for being too timid and not fighting openly for them, she later wrote in her last letter to Lossing on the subject, in 1879, in which she thanked him for his "vote on the monied question, in the name of all women", that she was grateful to Raymond, who's tip started the process of change. She said of Raymond, who had by then died, "We shall not see his like again." 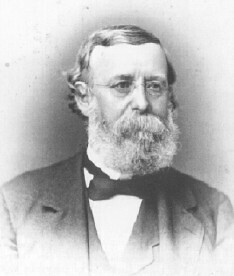 Lossing's motion at the Board of Trustees meeting in 1872 lowered the $16 weekly charge to $10 maximum, and ensured that no room or furniture rent would be charged to any professor of the college, and that the accounts with the professors of the last year would be adjusted and settled upon this basis. 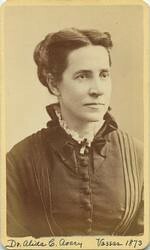 Alida Avery left Vassar later in 1874 and moved to Denver, where she became Superintendent of Hygiene for Colorado and opened a private practice. She was said to have made $10,000 per annum. Maria Mitchell however, stayed much longer, until 1888.